Vent under the statue blowing out steam at 100 degrees Celsius! Agave century plant, blooms only once in 60 years! A piece of the white matter which was broken off is displayed. 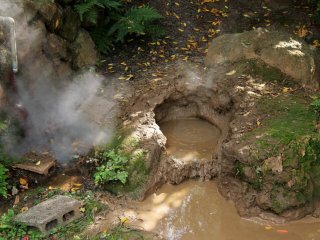 Beppu, one of the best hot spring cities in the world, is also known for its "hells" (in Japanese "jigoku" 地獄). Seven photogenic hot springs which will definitely stimulate your senses. 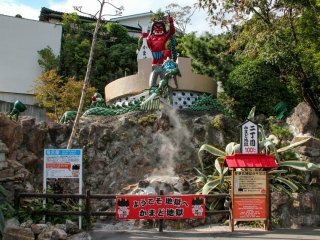 A nice video about the hells can be found here Japan Travel Beppu Jigoku Meguri Hells tour (they used to be eight of them but one is closed at the moment with no known plans of re-opening). Since I like to take my time visiting places I decided to visit each one separately with a slow pace, starting with Kamado Jigoku, also known as the "Cooking Pot Hell". There are two ticket offices and entrance-exits, the south and east one. Kamado Jigoku has six districts or points of interest, since the first one is just after the south ticket office I decided to enter through here. The entrance fee is ¥400 or if you plan to visit the other hells as well you can have a combination ticket for all seven hells for ¥2,000 (valid for two consecutive days). If you have purchased the "Be Beppu" booklet you can have a 10% discount for the combination ticket for all seven hells plus a free onsen egg in Kamado Jigoku. 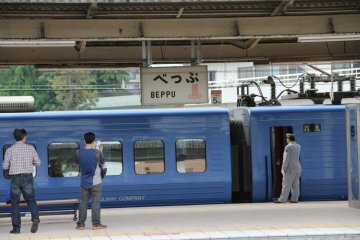 "Be Beppu" is an information guidebook about Beppu made by Beppus Tourism Information which apart of the information and photos offers many free bath tickets and discount coupons. It costs ¥500 and totally worth the money, you can get it from the tourism information office inside JR Beppu station. 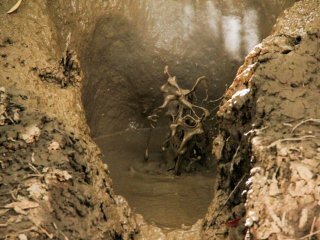 After the entrance you will find the first hell, a bubbling hot 90 degrees Celsius thermal mud. You can hear the bubbles burst and if you look carefully you'll notice the interesting bubble burst liquid formations. Afterwards you will be greeted by a Japanese demon (oni) statue. Under it, is a vent which blows out steam at 100 degrees Celsius. Some interesting information is written at the info board, if you hold a lighted cigarette or a match and strongly blow the lighted tip towards the steam, the steam intensity will instantly increase. This is the case with all the steam coming out from the hells as well. On the left there is an Agave century plant which blooms only once in 60 years. Passing the statue you will find yourself at a beautiful cobalt blue hell. It is 85 degrees Celsius and there is steam pouring out. 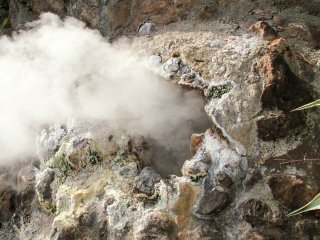 An information board tells you that the white substance seen all around the hell is composed of amorphous silica (inorganic material commonly used in semiconductor circuits) and hot spring deposits. It takes around 70 years to form. Continuing past the beautiful blue pond it's time for you to relax a little bit before you proceed to the next attraction. There is a bench which you can sit and warm up your feet on the hot stones, just make sure you remove your shoes. Then you can actually drink and taste the hot spring water, be careful to do sip down slowly as the water can be as hot as 80 degrees Celsius. If you are still not warm enough, a nice steam bath for your feet and hands will make you relaxed. And finally there is a steam bath for your throat and face skin. Steam pours out from tubes, you can just place your face in front of it and if you open your mouth it will reach your throat as well. The steam pours out at 100 degrees Celsius. 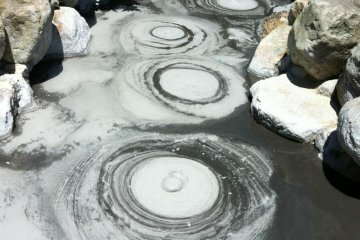 Further on, there is one more thermal mud pond with a temperature of 80 degrees Celsius. 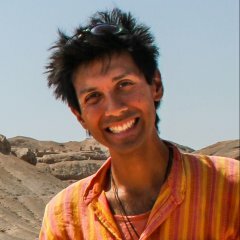 You can see mud bubble bursts here as well but not as intense as the previous one (at least during my visit). And then you will be at the biggest and probably the most photogenic hell of Kamado Jigoku. A big pond of silky blue color. An information sign states that the ponds color changes several times a year, from dark to light and from blue to green color. The explanation to this phenomenon is yet to be found. You can walk around the circumference of the pond enjoying the various different points of view. There is a vent that sprouts hot water with steam and it's the point where most of the people make a stop. Not only because you actually get sprinkled while you pass by but because usually the person in charge will blow with a lighted cigarette or a candle towards the vent causing an instant increase of its intensity which lasts for quite a few seconds offering an even more thrilling spectacle. The last pond is one more thermal mud one, like the two previous ones. This one had a bit more reddish color and there is no particular area for muddy bubble bursts, it seems that it boils from everywhere. The difference in color is due to iron contained in the soil. 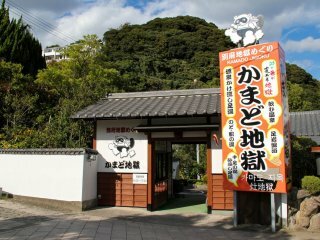 Finally, there is a large foot bath and a shop serving drinks and steamed delicacies, eggs and vegetables. Everything steamed in the hells steam of course. The egg sold is special, named "Onsen Piitan", its shell looks normal but once you break it you will notice the difference, not only the color of the egg is different, but the taste was also rich and extremely delicious. As soft as it needed to be with a unique flavor that will give you cravings for more eggs. This egg sold in Kamado Jigoku is very special and differs from the other onsen eggs as it is steam cooked for around 24 hours. The different color and rich taste is the result of this prolonged steamed cooking and this is also one of the reasons they want to distinguish it from the rest of the onsen eggs, thus naming it "Onsen Piitan". They sell more than 3,000 eggs daily. To be honest I also bought more eggs to eat and when I looked at the next table stand, two guys had just bought 16 of them. One egg costs ¥70, five of them ¥315 and eight ¥500. You can get a free egg if you have the "Be Beppu" booklet, information about it at the top of this post. Exiting there is a souvenir shop selling all kinds of interesting things but before that I saw this small garden which had some very cute stones with cat paintings. I thought that somebody around there must definitely love cats and then I saw something moving on the other side of the garden and finally understood where the inspiration comes from. A beautiful white, green eyed cat was moving around, gave me a look from afar and then vanished in the vegetation. Apparently I learned that cats love to be around onsens and hot springs for various reasons. From the warmth provided to ease in giving birth, the kittens have more possibilities to survive the winter. Plus, cats are not the only creatures attracted to the warmth, all kinds of insects come as well which are a good source of cat food. I exited from the east ticket office exit/entrance but there was one last surprise for me. 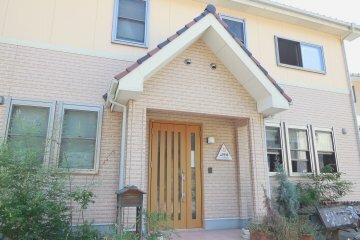 I went past the toilets and just next to the east tickets office I noticed a building which had "iyashinoyu" written in Japanese. I got excited as it looked like an onsen, something that the ticket office confirmed. 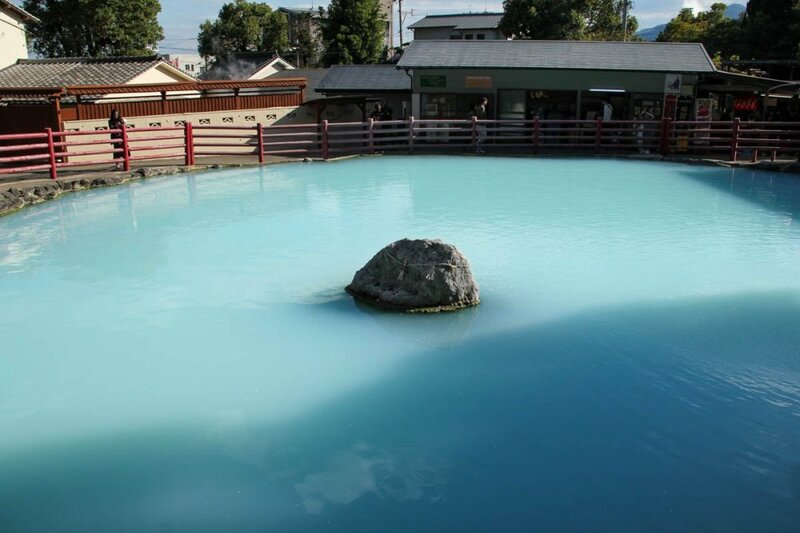 It happens that if you have purchased an entry ticket for Kamado Jigoku you can use this onsen for free. But you need to go to the east ticket office and ask for the key, you unlock, bath, lock again and return the key. 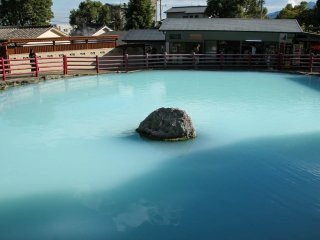 So you can even have a real onsen experience after visiting the beautiful hells of Kamado Jigoku. It seems that most of the people are unaware of this hidden gem plus there is no English sign. Later on I found out that the onsen was built by the Kamado Jigoku owner for family use but he has it open for visitors as well. An excellent way to finish your visit in Kamado Jigoku. 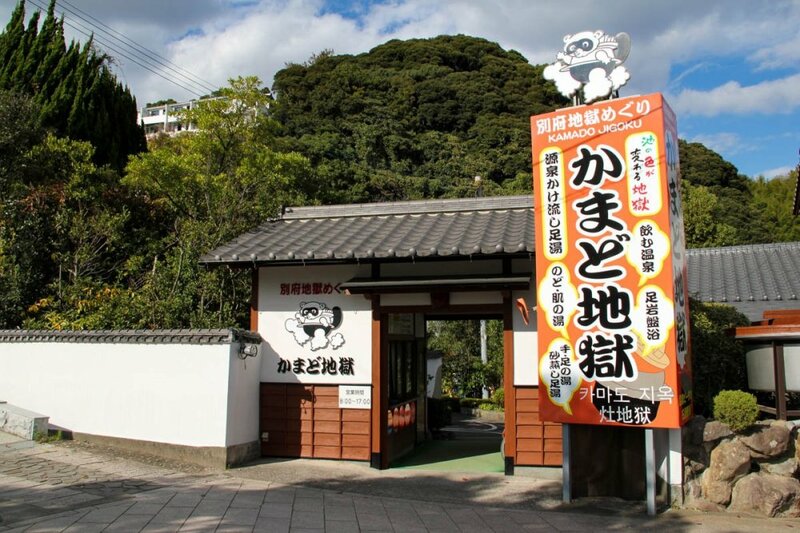 From JR Beppu station you can use bus numbers 2, 5, 41, 43 and go down at "Umi Jigoku Mae", Kamado Jigoku is a few minutes walk from the bus station. I want to swim in the emerald pond. I know it's dangerous, though! I would love to swim in that pond too!! I checked the water temperature with my hand around the edges of it and it wasn't killer hot, definitely hot but maybe challenging bearable for bathing...? 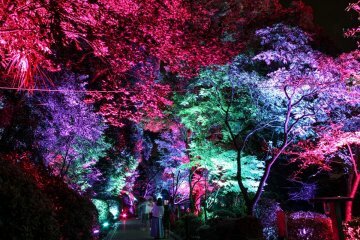 Mother Nature is incredible - and Beppu has so much amazing stuff to see!